If you’re an Alarm.com and Apple user, your voice just got way more powerful. Siri Shortcuts for Alarm.com is a new voice control integration that lets you activate Alarm.com Scenes by talking to Siri, using customizable voice ‘shortcuts’. These shortcuts integrate into your existing routines and reflect how you naturally talk, making it even easier and more intuitive to interact with your smart home. Here’s what you can do with Siri Shortcuts for Alarm.com. 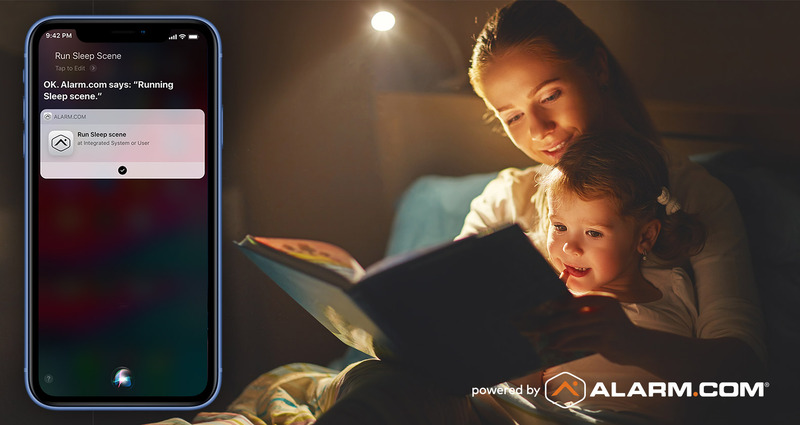 Alarm.com Scenes let you control any or all of your smart devices – lights, garage door, locks, thermostat, or security system – with a single command. Siri Shortcuts gives you a new way to activate Scenes with your voice alone. Just use your Alarm.com appto set up a custom Siri voice command to trigger any Alarm.com scene—you can be as creative or as natural with your commands as you like—and get talking. You could start the day with a cheery “Hey Siri… good morning!” command to activate your Alarm.com Wake Up scene, which turns on your lights and disarms your security system. Later on, a whispered “Hey Siri: baby’s nap time,” could activate a custom scene for your nursery that turns the lights down and switches on the smart plug for your baby’s sound machine. When you arrive home, you don’t even need to open your Alarm.com app. Just use Apple CarPlay or your iPhone to activate Siri and use your shortcut phrase to trigger your “Home” scene. You can also use Apple’s Shortcuts app to create multitasking shortcuts that combine Alarm.com actions with other app commands. 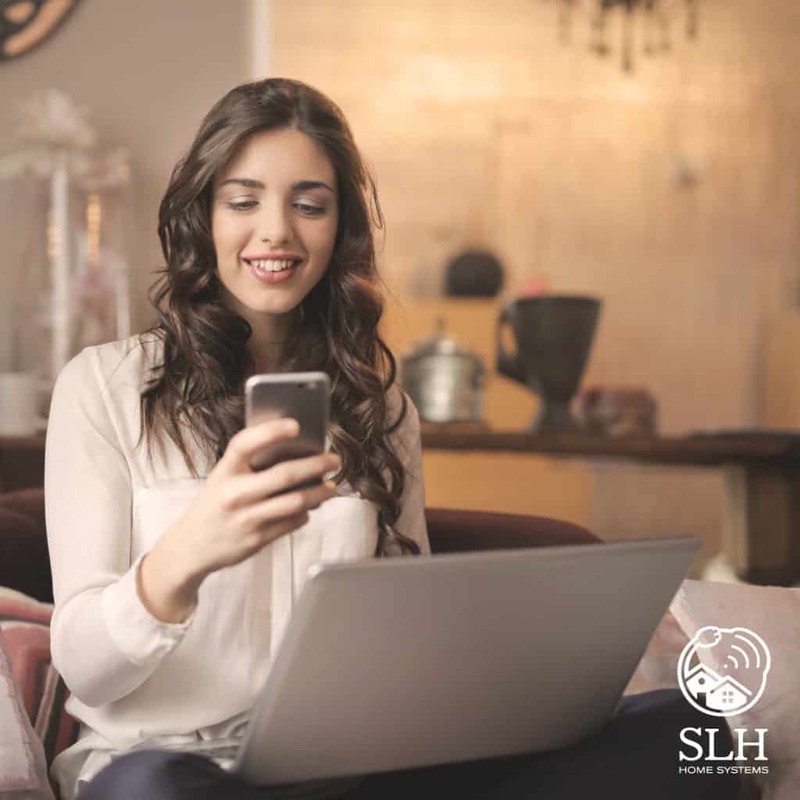 It’s a new way to eliminate ‘app overload’ and weave your smart home’s useful abilities closer together with the other technology you use every day. For example, you could incorporate your “Sleep” Alarm.com scene into a “Good Night” Siri shortcut. As well as turning your lights down, locking the doors and arming the security system, you could have this shortcut set your iPhone’s morning alarm and activate its “Do Not Disturb” mode. For the morning, you could incorporate your “Away” Alarm.com scene into a “Heading Out” Siri shortcut that not only secures your house and turns the thermostat down, but also pulls up directions to your next calendar appointment via car, walking, or even metro. 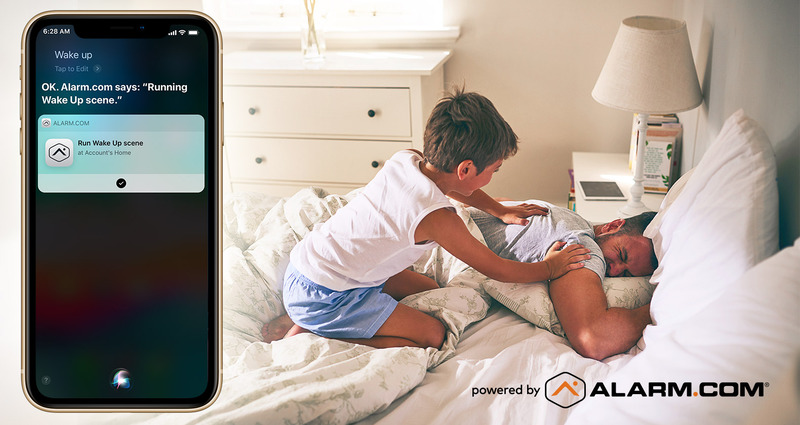 As the leading platform for the connected home, we’re always working to improve your Alarm.com experience with new features and enhancements. For more news on recent Alarm.com updates, click here.